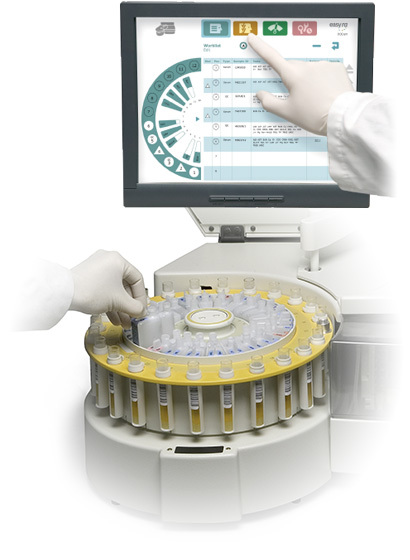 Medica offers a low-cost, easy-to-use, fully automated clinical chemistry analyzer for small to medium-size laboratories. The EasyRA® analyzer is specifically designed to provide high-quality clinical chemistry analysis with low operating costs. The EasyRA analyzer has a simple and intuitive touchscreen user interface that makes operation easy and guarantees rapid training for all user skill levels. The user interface allows easy tracking of all routine maintenance activities. A modular design makes the EasyRA analyzer simple to maintain for users and service technicians, ensuring maximum uptime. Reagents include a wireless RFID chip that contains all test information, alerts the user to calibration intervals, and allows for automatic usage tracking and reagent inventory management.